Smuggler’s Notch Feels Like Way-Back-When But With Up-To-Date Conveniences. There are lots of blues at Smuggler’s for cruising seniors. That’s Stowe in the distance. 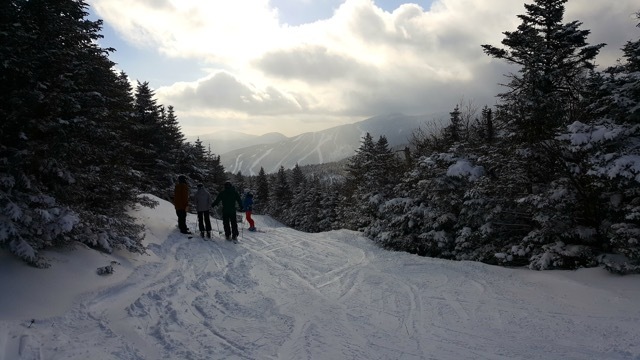 Smugglers’ Notch is the well-known kid-friendly ski area in northern Vermont. That same dedication to fun also makes it a good area for seniors. Start with the intermediate trails winding off the two upper Mountains—Madonna, 3,640 feet, and Sterling, 3,040 feet. 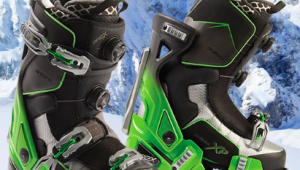 They urge your skis to turn as they follow the mountain’s contours in delightful turns and drops. Smuggs has the only triple black trail in the East—Black Hole— with a 53 degree slope angle. But there are also many ego-boost blues like Madonna’s Upper Chilcoot and Drifter, where you turn where the trail turns, and Sterling’s Thomke’s, Rumrunner, Hangman’s, Treasure, FIS, and Black Snake. Doable glades include Red Fox, Three Mtn., and several “variations” of the trail you are on. The goal here is to always let you have access to the woods should you so desire. Bring them on! Glade skiing is well known here. When you ride up Sterling, you see Madonna’s wooded flank dropping into the ravine below. All those glades are skiable or snowboardable, says Public Relations Director Mike Chait enthusiastically. Furthermore, all trails are well defined from top to bottom so no worry about ending up on a black diamond trail by accident and all trails funnel to their respective base areas for pro-choice group skiing. Meanwhile, The Village Center at Morse Mountain is served by four lifts and 99 percent beginner terrain where you can ski at a peaceful pace. Views? From the Catwalk, you can look across the Notch to Mt. Mansfield’s trails at Stowe. Remember when these two resorts were connected? The experiences kindle feelings of New England skiing way back when, but with all the up-to-date conveniences. By not being overdeveloped, Smuggs maintains a nostalgic feel. Somewhat remote (although only 30 miles from Burlington), midweek is quiet, and the powder stashes linger. Seniors are looked after. 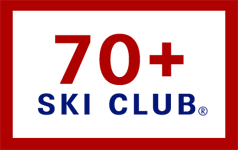 The Smugglers’ Notch 55+ Club is a 26-year-old club that meets every Wednesday for skiing and camaraderie. It has more than 100 members, and about 30 to 35 skiers show up each week. Coffee at 9 a.m., followed by Alpine or Nordic skiing and snowshoeing, then a 1 p.m. program. Membership is $30 for the season, which includes continental breakfast, 50 percent discount off lift tickets, and other discounts. Most members are Vermonters who live within an hour radius of Smuggs with a wide range of skiing ability, including ex ski patrollers and instructors. Guests and new members are warmly welcomed, says Deborah Pomeroy, club president. New this winter is FunZone 2.0, a 26,000 square foot indoor playground, a $4.2 million investment reflecting the area’s decades-long focus on family fun. Laser tag anyone? Total Trails: 78. 300 acres of marked and patrolled terrain. Plus 700 acres of unmarked and unpatrolled terrain. 19% easier, 56% intermediate, 20% expert, and 5% extreme. Longest run: 3 miles, from the Madonna summit to the Village.